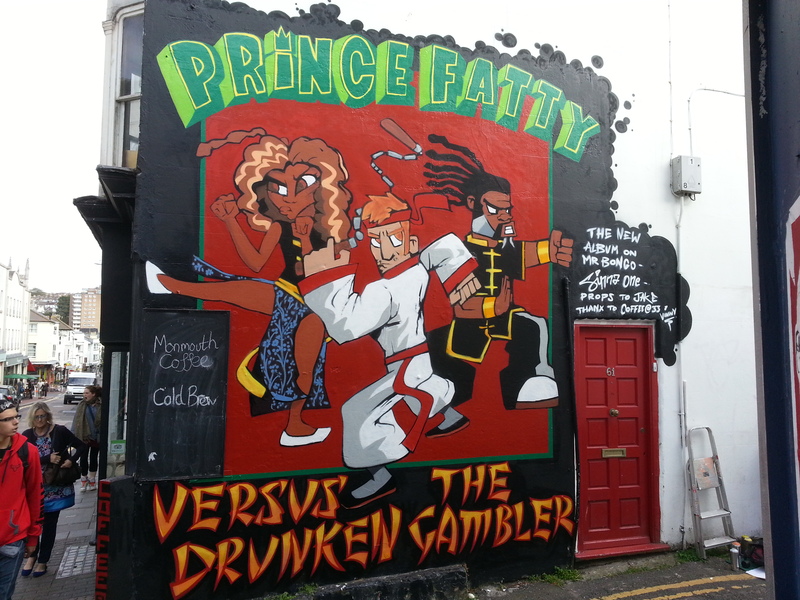 As the summer was drawing to a close and the weather was still fine, I managed to fit in a little mural for Prince Fatty’s new album release – Prince Fatty Versus the Drunken Gambler. Prince Fatty asked me to recreate the album artwork, originally drawn by famous illustrator JAKe, on a big wall in Brighton. The image shows Fatty, Holie Cook and Horseman ready to battle na Kung Fu stylie. This was another challenging commission, as I am so used to drawing my own artwork, and it took a day just to get the original sketch to how it should look. I was happy with the end result and more importantly, Fatty was over the moon. There is a time lapse of the piece being painted on the way. The album is out now on Mr Bongo.